Like a knife in the block, Zwilling JA Henckels’ sleek new flagship store fits perfectly within Shanghai’s sophisticated city centre. 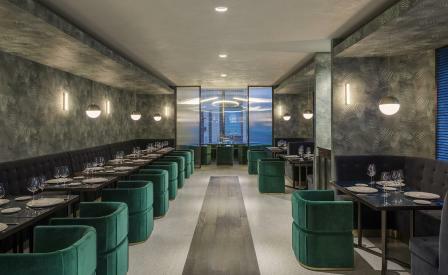 Designed by Matteo Thun and Antonio Rodriguez – whose decade-long relationship with the knife manufacturer includes the design for both products and interiors – the venue follows on the heels of an out-of-town factory store as Zwilling’s second outpost in the city. The light-filled ground floor showcases the brand’s knives, including a new collection with rose gold blades, and cookware in concrete and light oak wood displays against grey terrazzo flooring. Encircling a cascade of greenery, a staircase sweeps up to the second-floor gourmet cooking school, outfitted in white marble and stainless steel, and The Twins, a Mediterranean-influenced restaurant (think crispy sea bass) by Cornelia Poletto. An elegant-yet-rustic bar runs down the narrow space, leading into tables, punctuated by Japanese maples, for casual dining, and finally a luxurious fine dining room featuring navy and teal velvet seating, brass accents and palm leaf printed wallpaper.